The Test of English as a Foreign Language (TOEFL) measures the ability of non-native speakers of English to use and understand American English as it is spoken, written and heard in college and university settings. Most people who take the TOEFL test are planning to study at colleges and universities where instruction is in English. In addition, many government agencies, licensing/certification agencies, as well as scholarship and exchange programs use TOEFL scores to evaluate English proficiency. The 4-hour TOEFL internet-based test (IBT) has four sections: Reading, Listening, Speaking and Writing. These four sections are equally weighted and the total score is 120. The emphasis is on integrated skills and the TOEFL iBT is arguably a better gauge of the students' proficiency to communicate ideas in English. TOEFL preparation is a must! To score well on the test, knowing the structure, instructions and mindset of the test makers is imperative! 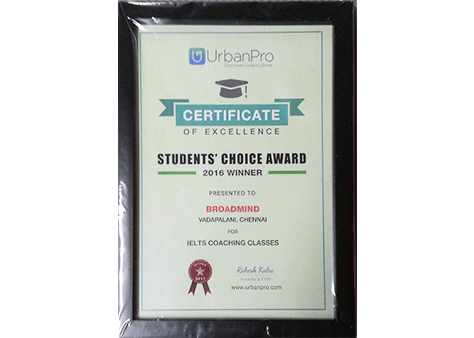 We aim to impart these strategies through our proven and rigorous programs. 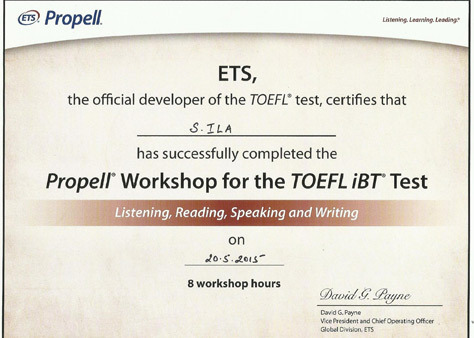 TOEFL is conducted and managed by ETS (Education Testing Service),a reputed institution for English language testing. TOEFL is accepted by over 6000 institutions all over the world which makes a TOEFL a good option for study abroad. TOEFL tests can be completed within one day. 9 out of 10 institutions prefer TOEFL scores for admissions abroad. Test Accepted By US & Canada, Few universities in the UK and New Zealand. Test Report After 3-4 weeks of taking the test. Test Period Every month but fixed dates. Mode of Registration Online, Telephonic or by Post. In the reading section, The student is asked to read 3 or 4 passages from academic tests and questions are asked relating to the passage. Atleast 40 to 50 questions are asked. The duration of the test is 60–80 minutes. In the listening section, the student is asked to listen to lectures or conversations and then questions are asked related to that. Atleast 35 to 51 questions are asked. The duration of the test is 60–90 minutes. In the speaking section, the student is asked to speak about a familiar topic. The duration of the test is 20 minutes. In the writing section, the student is asked to write an essay based on the reading and listening task. The duration of the test is 50 minutes. TOEFL course offers extensive coverage on all topics. Our Trainer will examine key fundamentals, the right approach, effective solving techniques and test-taking strategies. No stone will be left unturned! Expect plenty of interaction and practice from the leading TOEFL specialist. We are so confident of the quality of our TOEFL preparation programs that we guarantee that your official TOEFL score will increase by at least 20 points after going through our proven programs. Team of professional trainers with necessary professional experience and academic qualification would train you. Our full-time, highly-trained test prep specialists have also achieved extremely high TOEFL scores, are immensely popular with their students and have stellar track records in producing top scoring students. Our classes have small numbers that enables the instructor to give individual attention to each individual student, without sacrificing important group interaction and discussion. You will receive all the study materials that you will need to ace your TOEFL. Access extensive notes, cheat sheets, practice questions, mock tests and vocabulary lists! Our learning systems are constantly updated by our highly experienced in-house R&D team. So you can be assured that you will be in touch with the latest techniques and testing trend. We maintain a well-stocked resource library that our students have full access to. British Council certified trainer for BEC and IELTS. Experience of handling communication skills for Colleges Students and Working Professionals. 10 plus years of experience in facilitating and training adults in the aspects of spoken English, soft skills, IELTS, BEC , PTE etc. Have 10 plus years of working experience as a lecturer in English. Working Experience with Premier training centres. Trained National and Foreign Corporate (Korean) in Spoken English. International diploma in Teaching and Training from Cambridge (CIDTT) with distinction. On-line Training experience for all levels in English etc. Content writer for spoken English, IELTS etc. Well trained with good coaching classes. I am happy to say this that I loved the homely atmosphere and good staffs. They helped me in a polite manner. Thank you BroadMind! English and Maths classes are really good, with enough materials to study from both the class teachers. We did not start doing maths concept. I have to wait to give a feedback till I get in to all the concepts.